Nursing in the jungle is like nothing else. There is no Google searches or doctors just a phone call away. There are no clean hospital beds that move at the touch of a button for the patients comfort. There is no PYXIS stocked full of the latest and greatest medications. In fact, we are grateful when we have medications that are only expired by a few years. There is no sterile OR or ER. No EKG equipment, no oxygen tanks, no masks (for you or the patient). No “staff assist” or Code buttons. No crash cart ready to roll. The only resources that are available to you are the ones you brought in yourself. Sure, there are medical evacuation flights that happen but in real emergencies (heart attacks, anaphylaxis,hemorrhaging, etc) the likelihood of getting in touch with a pilot and them flying the hour or more in time is very slim. Everything you learn in medical/nursing school is all but thrown out the window and prayer becomes priority. We first visited a lady who had been sick for several weeks. She was given an IV infusion by government nurses a few weeks ago but they left the village before any improvement was seen. When we visited her she was too exhausted to get up from her bed (which is a mat on bamboo floors). Kathleen suspected Malaria. We gave her the medications we had and prayed with her. We visited again the next morning to find her sitting up by the fire! By the end of the week she was walking to neighbors houses and even came to the evangelistic meetings. After morning visitations we were asked to visit another lady. Not sure what to expect we agreed, and made our way to her house. She graciously invited us in. We all shook hands with her (as that is the culture). I immediately noticed her hand. She could not extend herfingers out straight, and her skin felt very dry. She sat down talking with Kathleen, and that’s when I noticed her feet. 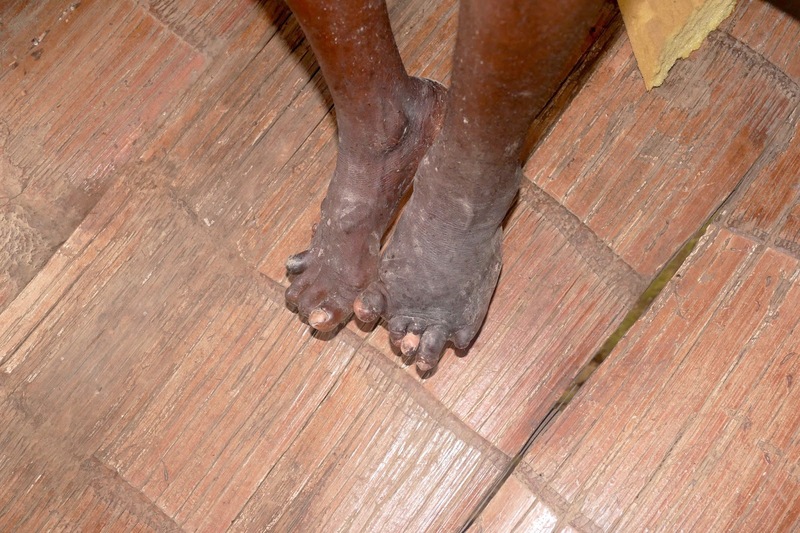 Her left foot looked clubbed and she was missing several toes on both feet. Through Kathleen we heard her story. This disease process started when she was little. It first went to her left foot (which wasnoticeably shorter and swollen). Slowly her toes began to fall off. It then went to her right foot and lastly to her right hand. 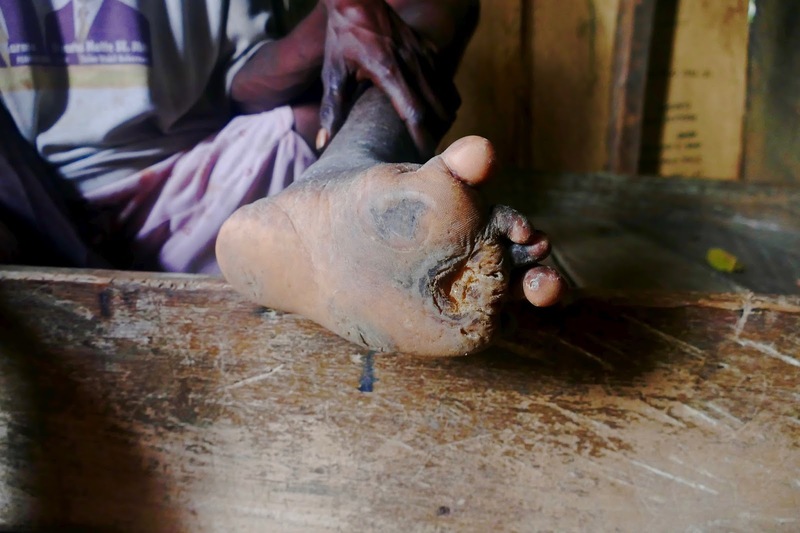 She said she had lost most of the feeling in her left foot and her right hand was rendered useless. Ashley also noted that she looked like she was loosing hair. My first thought was leprosy just by the way she described her body parts falling off, but quickly dismissed it because neither her kids nor her husband had it (we later learned that there are 4 types of leprosy and only one is severely contagious as we think of in Bible times). She then showed us an ulcer that wasn’t healing on the bottom of her foot. So we also played with the idea of diabetes but quickly threw that out too. If it was Type I (juvenilediabetes) she most likely would’ve died years ago because there’s zero access to insulin this far out in the jungle. This is as far as she can extend her fingers. We prayed with her and left her house feeling very stumped. Paige, Ashley and I began pouring over some village medical guides we had brought. The only diagnosis we could come up with that remotely matched her symptoms was Tuberculoid Leprosy (but in researching it further I’m not so sure anymore). We unfortunately left her untreated because how can wetreat or advise for something we can’t diagnose? 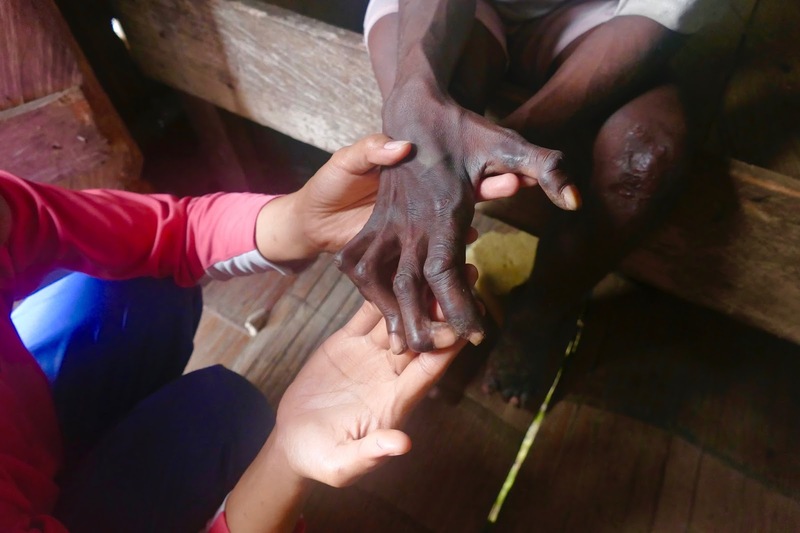 And even if our diagnosis was correct, we didn’t have leprosy medication (which could take up to 2 years of continual meds to treat). Any doctors or nurses who have a diagnosis I’d love to know! Continued story from Part 2…. Braids were being given and breakfast was cooking when a father and daughter (who is maybe 1 ½ years old) show up on our front porch. With a lot of motions and slow Indonesian, Pastor Yeri tells us the gist of what happened. He sticks his left hand out and then with his right he makes chopping motions over his fingers. The father begins pulling the girl’s hand out form under her bloody sleeve and my stomach immediately drops to my feet as I brace myself to see mangled and/or missing fingers. Although they were crusted with blood, there were still 5 fingers! Through Kathleen we learned, her sister wanted to open a coconut with a machete. This little girl wanted to help by holding the coconut but her sister missed, cutting her finger. We cleaned and bandaged her up and sent the father and daughter on their way. She never even cried! 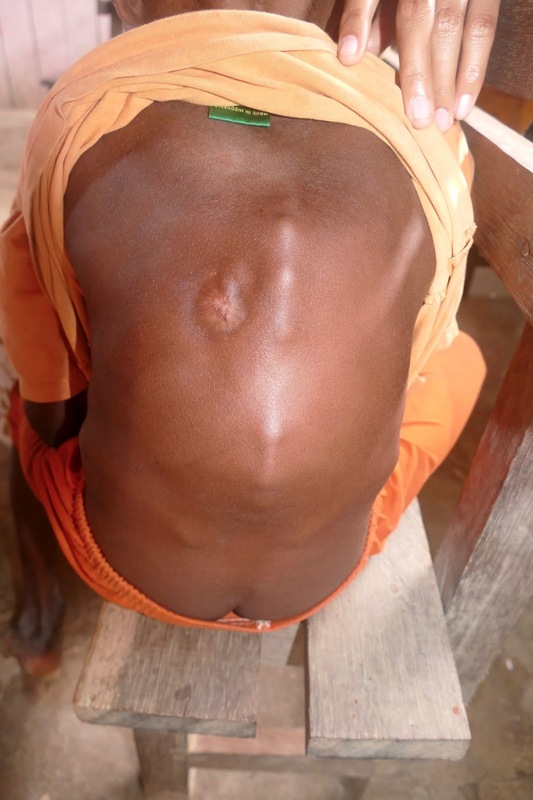 All week we had seen Iwan running around playing with the other children but it was obvious he had a spinal deformities. At first we thought it was perhaps severe scoliosis but instead of his spine making as “S” shape it looked more like kyphosis or hutch-backed. Finally, we pulled him aside and talked with him in private as to not embarrass him in front of the other children. He was so shy and wouldn’t answer more than his name and yes or no questions. It hurtshim to walk and run but he wants to play anyway. He had no breathing issues (that he would say or that we could hear). A mother stepped in with us and told us what she rememberedhappening. She said it started as a wound. Another kid had struck him on the back with a stick, and there was still a small scar. The mom also told us that for the past 2 years he hadbeen unable to walk, but that earlier this year he had started walking and now he runs and plays. It’s hard to know what may have gotten lost in translation or what really did happenbut again any medical advise would be greatly appreciated. Kathryn Schreiner is a student missionary from Southern Adventist University, with her AS in Nursing, serving as a health educator and consultant in Papua Indonesia. You can read more at her blog, Adventurous at Heart.